Wooden POS Displays are excellent items for getting customers to know and love your quality brew. It make your beer bottles accessible to the hands of the public. It also captivates passerby with its clever designs and messages. As the beer industry continues to grow, more and more brands continue to fill in-store shelves leaving no vacancies for competing labels. So it is a fantastic idea to incorporate wooden POS displays for your products to welcome customers in their local grocery stores. Popular names in the brewery business, such as Birra Moretti and Corona, have been adopting the use of natural wood and wood-looking material. 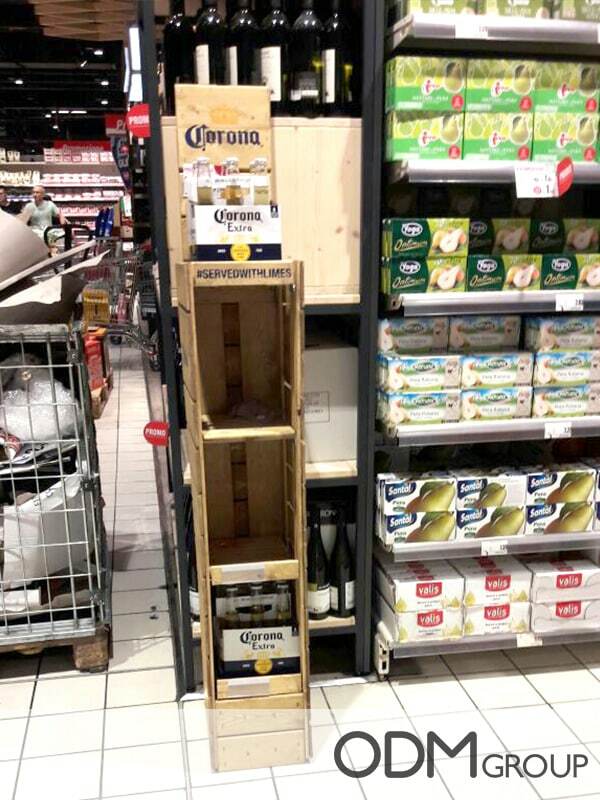 Recently spotted in Italy, this slim vertical store shelf by Corona provides a four-level space to display the bottles. The famous brand of Pale Lager has chosen natural wood as it’s material, which seems to convey the feel of grabbing a bottle fresh from the brewery. We love the use of ‘#servedwithlimes’ and our only criticism for this display is that it is very narrow so doesn’t allow much products to be displayed . This requires a lot of staff attention to restock which isn’t guaranteed and may put your sales at risk. 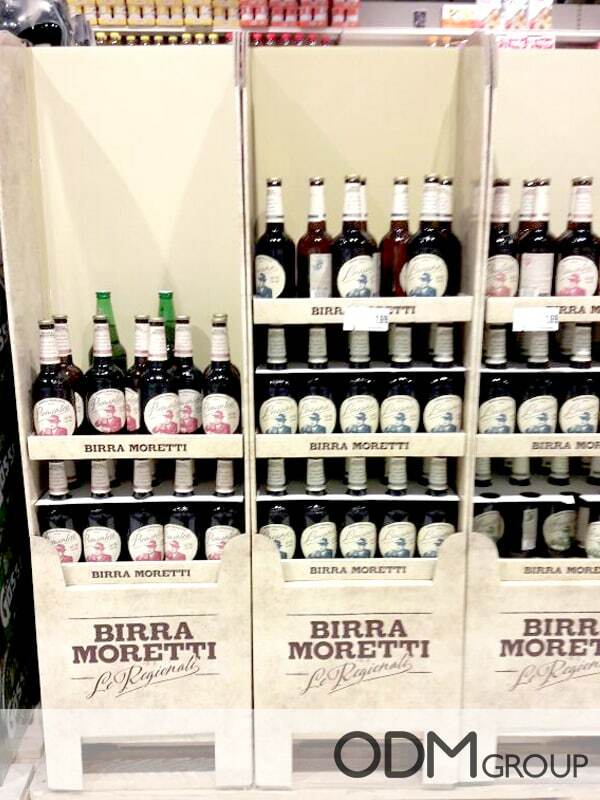 Birra Moretti was also spotted in Italy with personalized POS display shelves. The Italian brewing company had similarly chosen wood-looking material. They focused on MDF and cardboard, rather than on natural pine. This is a very cost-effective option, allowing to create cheaper displays and have 3 of them in row instead of just one, maximising the shelf space. With this, they are able to stack up to five heavy cases of their quality liquors. What makes wooden POS displays so effective is how it give products a comfortable, eye-catching space where the product can gather attention. In order for the displays to secure a stack of heavy beer bottles, it needs to be made sturdy by choosing the best material for your display shelves. Some companies have opted to use cardboards for their beer POS displays for affordability and for ease of transportation. However, it is unable to support heavy beer bottles as it is made with light-weight materials. This means it wears the material over time. As a solution to this, people have chosen the use of wood as it provides both affordability and for ease of transportation while making it durable and stylish. With wooden POS displays, companies will be able to benefit more in getting ahead of the competition. Through the use of POS displays, your business will be able to achieve it’s sales goals. This method is an effective way of introducing your merchandise to plenty of consumers ready to make a purchase. In addition, having a POS display provides several benefits which provide convenience for both you and your customers. Brand logo is well placed. Regular store shelves are stationary places where merchandises can be confined to aisles. 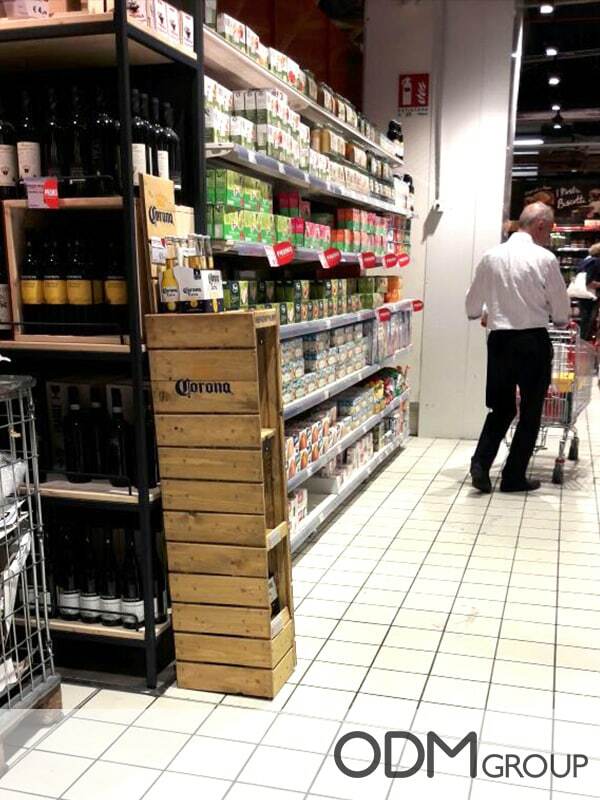 Assigning beer POS displays in other locations of the marketplace increases the chance of customers noticing the product as a result. Enhances brand visibility. In-store displays are also great in improves brand visibility. Its surfaces can work as a canvas to allow printers, making it easier for people to easily identify your brand. Practicality and Quality. Use of the wooden material will convey a sense of quality and emphasise how your brand stands out from the others. As you may already know, other companies have already taken advantage of this game plan and have already set up their shelves in several markets. Thus, making it an established form of bringing the products to the masses. Boost your sales. All of these factors will increase the desirability of you brand and therefore the wooden POS displays will allow businesses to sell products in higher quantity. Thereby, ensuring profitability. No doubt, it is a wise step in making sure that your business has one available. It improves the way you advertise and sell your product directly to your consumers. Are you looking for a better way to introduce your products? Let us know. We’ll help create your own wooden POS displays for you. Looking for ideas for a POS display? Then, check out the links below.